Everyone who visits our practice knows the importance of teeth cannot be underestimated. The quality of teeth affect our ability to speak and eat. They also affect jaw and facial structure. Although their main purpose is to help break down food for proper digestion, it’s interesting to examine the unique, beautiful purpose of each type of tooth. 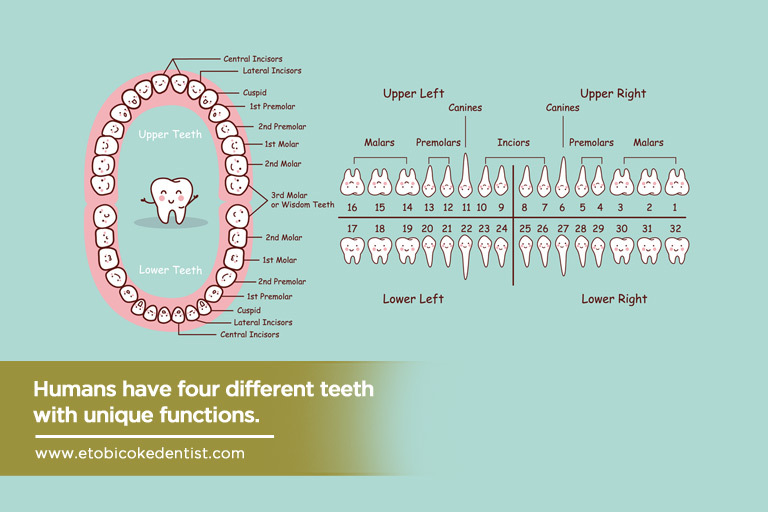 There are five different types of teeth; knowing their specific function might help us appreciate them even more. How well do you know your pearly whites? Development starts long before the eruption of the first “baby” tooth. While that usually appears at about six months, teeth start growing in utero, as early in the second trimester of pregnancy. 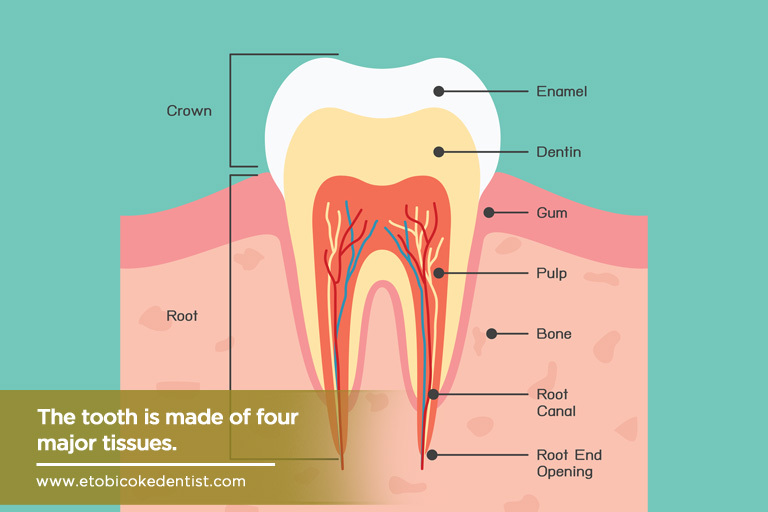 The crown is formed first, and its roots continue to develop after the tooth appears above the gums. A set of 20 primary (or “milk”) teeth grows and comes to maturity when children are between 2 1/2 and 3 years of age. The teeth remain in place until around year 6. 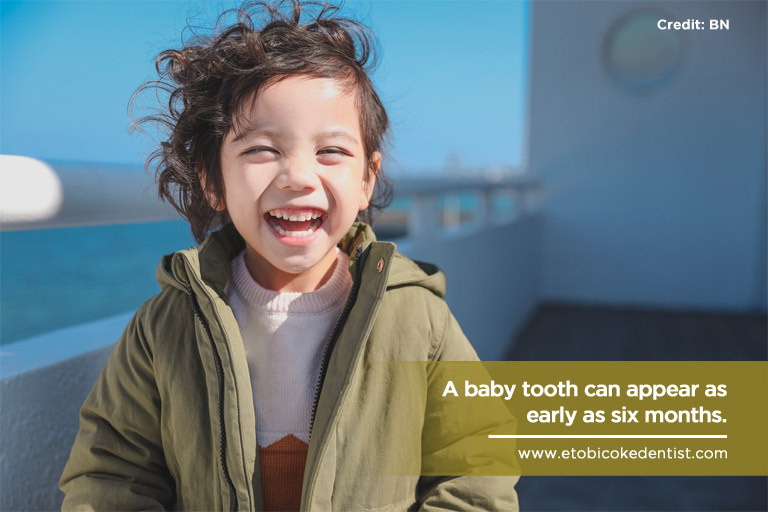 These primary teeth usually begin to fall out from age 6 to 12, and, one by one, are replaced by a set of 32 larger, “permanent” teeth. Contrary to what most might think, bone is not harder than a tooth. Teeth are very strong, and have two major parts: the crown and roots. The crown of the tooth is usually visible in the mouth, while the root grows below the gumline (or gingiva) and anchors to a bony socket. 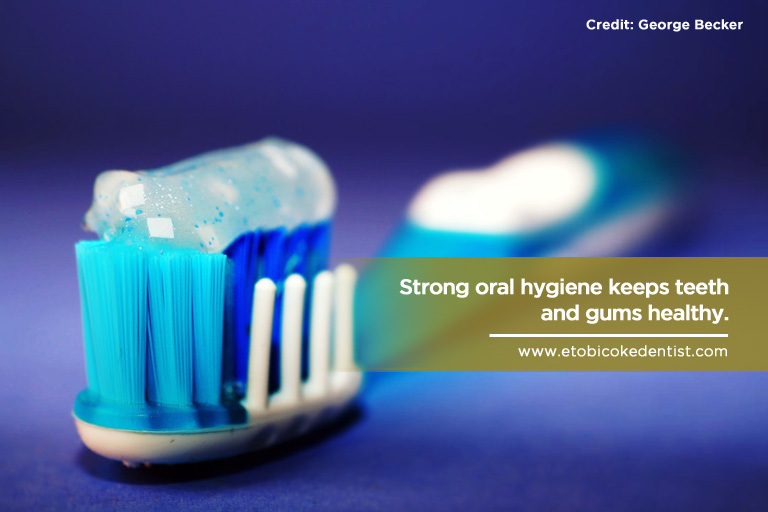 However, gum problems and hard brushing can expose a portion of the root in the gumline. Enamel – Tooth enamel is the hardest substance in the human body. This highly mineralized substance is primarily made of hydroxyapatite. This major tissue covers the exterior of each tooth and protects other major tissues underneath. The formation of tooth enamel occurs when a tooth develops under the gums, before becoming visible. The colour of enamel varies from light yellow to a grayish white. Enamel creates a strong barrier that protects both outer and inner layers from decay-causing plaque and acid. Unfortunately, the body does not have the ability to replace damaged enamel. Unlike other body parts, enamel cannot regenerate — there are no living cells to perform this function. Avoid foods that are damaging to enamel. 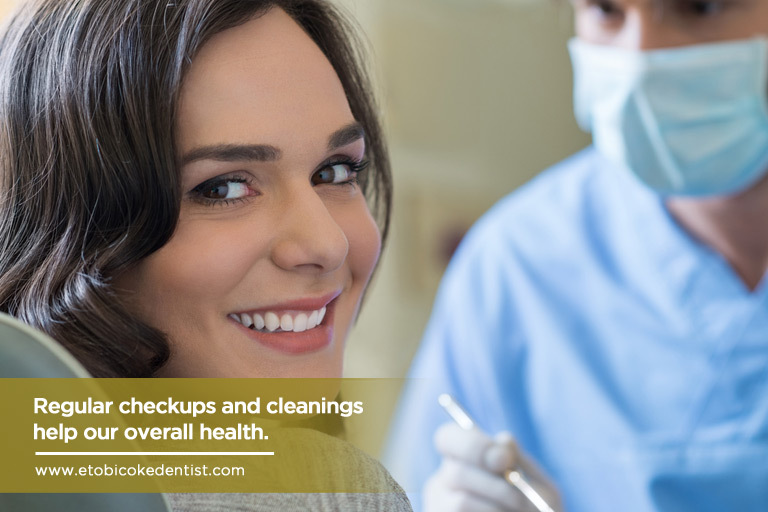 Perform regular oral hygiene and make twice-yearly visits to the dentist for a professional cleaning. This will help keep teeth healthy and strong. Dentin – Known as the second hardest tissue, dentin lies underneath enamel. This yellowish, porous tissue is made up of 70 percent hydroxyapatite, 20 organic matter, and 10 percent water. Within the dentin lies a sensitive layer of living tissues and microscopic channels known as dentinal tubules. This layer’s main function is to transmit signals from the enamel (or root) to the pulp. Sensory Function: Stimulation of the pulp can result in sensitivity to temperature, trauma, and pressure. Dentin Formation: The pulp plays an important role in the formation of dentin. It forms reparative dentin (or “secondary dentin”) in response to trauma. Nourishment: Blood vessels in the pulp chamber keep blood flowing to prevent a tooth from becoming brittle. They strengthen teeth by keeping them nourished and moisturized. Cementum – This layer of bone-like tissue protects the roots. Unlike bones, it does not have any blood supply or nerves. Its main function is to attach to collagen fibres in the periodontal ligament. It also supports the integrity of the root inside the gum and bone. Incisors – Comprising the eight teeth front teeth (four on top and four on bottom), we use these teeth for biting/tearing food. Incisors are the first set of teeth to develop and appear in our mouth. They are characterized by their thin and flat bottom, and a sharp and chisel-like shape. Situated between the cuspids, incisors are also known as “anterior teeth” because they make up most of our smile. Canines – Also referred to as cuspids, the canine is comprised of four sharp, pointed teeth situated on the sides of the incisors. It is the longest tooth with one pointed end and one root. The first set of canines appear around the age of 16 to 20 months. The permanent set emerges between ages 11 and 12. The primary upper canines erupt ahead of the lower canines. However, the order is reversed for permanent teeth. Their fundamental function is to tear or rip food. The position of the new teeth helps guide the mouth as it (ideally) grows into the best biting position. Premolars – Sitting next to the canines, premolars are used for chewing, crushing, and grinding foods. We have four premolars equally located at each side of the mouth (two upper and two lower jaw). They have a bigger size than the incisor and canine and have a flattened top surface with ridges designed for crunching foods into smaller pieces. Premolars are absent among baby teeth, but start to come in around 10 to 13 years of age. Molars – Located further back in the jaw, molars are considered the main masticators, with a basic function to chew and grind food. Primary molars are known as “deciduous molars,” which generally make an appearance between the age of 12 to 28 months. The first and second premolars replace primary molars when they start to fall out. The first permanent molars (four upper and four lower) emerge around age six, while the second set of permanent molars erupts from year 11 to 13. Our everyday habits affect teeth, gums, and our general health. In addition to daily brushing and flossing of teeth, visit your family dentist on a consistent basis. Thorough dental checkups and professional cleanings remove plaque and tartar from the surface of teeth. Your dentist can also watch for signs of any health issues and offer solutions. Love your teeth and your overall health will follow! For a great dentist in Etobicoke, call Dr. Mark Rhody Dentistry: (416) 231-4281. We use state-of-the-art technology and have a warm, comfortable environment for patients of all ages.